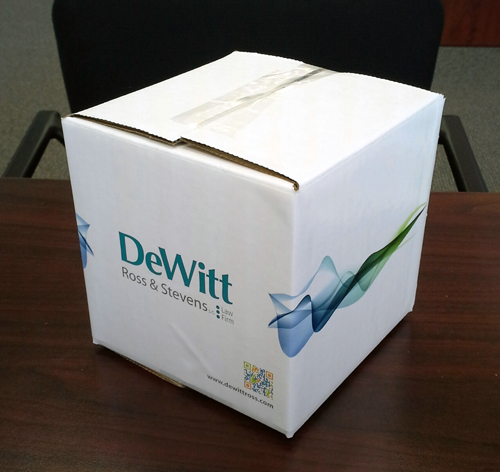 To increase brand awareness, Dewitt Ross & Stevens Law Firm sends out a 3D or “lumpy mailing” to prospective clients that promotes their Employee Stock Ownership Plan (ESOP) legal services. Michelle Friedman, Director of Marketing, was looking for a promotional item that would be useful and have staying power in recipients’ offices or homes, while still fitting into a small box for mailing. Magellan Promotions staff recommended the combination cell phone holder and iPad stand. It has a high-end look and durable construction, so it fit the goals of the firm’s direct mail campaign. 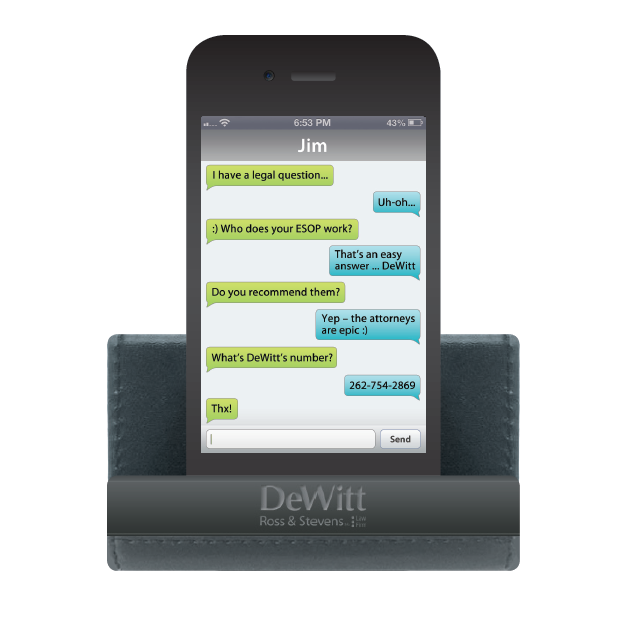 The Dewitt team designed a custom, phone-shaped mail card that was inserted into the phone holder. The card displayed a hypothetical text exchange about legal questions. 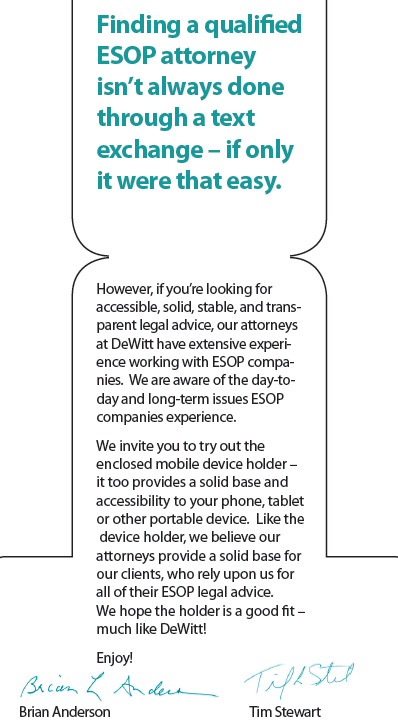 When unfolded, the card described that “Finding a qualified ESOP attorney isn’t always done through a text exchange – if only it were that easy.” More information about ESOP legal services, a call to action, and contact details follow on the rest of the card. Snapshot of un-folded mail card. The card was then inserted into the phone holder and packaged in a custom-branded box featuring the Dewitt Ross & Stevens logo and theme. The end result was a striking, 3D mail piece that was sure to be opened and appreciated by its recipients. All wrapped up in this attractive, custom box. The cell phone and iPad stand is a convenient desktop item that keeps technology or business cards within reach. Its small size – 2.25” high by 3.5” wide – makes it perfect for direct mail. A logo can be debossed on the front face. According to Michelle, the direct mail campaign helped build goodwill and brand Dewitt Ross & Stevens with prospects who may not have been aware of their firm. Post mailing, an influx of website views was reported on the ESOP group’s pages. Several recipients even sent thank you notes via email! Now that is a sign of an appreciated and effective promotional mailing. According to industry research, any 3D mail will help gain higher response rates. In a Silver Marketing Group Study, the direct mail piece that included a promotional item increased response rates by 50%. Furthermore, 3D mailings receive a 250% better response rate than standard mail, according to the Direct Marketing Association. If you want more than the average 4.4% response rate of standard mail, consider thinking of a branded boxed mailing with a promotional item, just as Dewitt Ross & Stevens did.